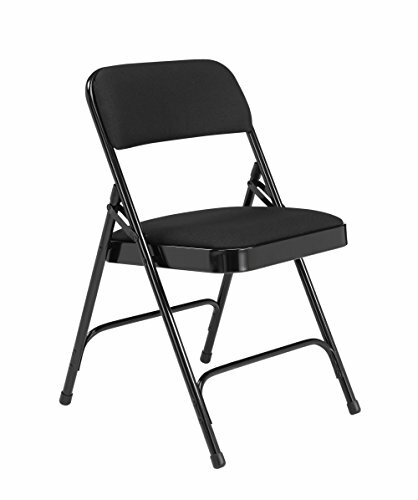 The National Public Seating 2200 Series steel frame upholstered premium fabric seat and back folding chair has a black, 18 gauge, 7/8" tubular steel "Y-frame" structure, black upholstered fabric seat and backrest, double-riveted front and rear leg cross braces, double hinges on each side, and it folds for efficient storage when not in use. This chair meets the American National Standards Institute/Business & Institutional Furniture Manufacturers Association (ANSI/BIFMA) standard for drop weight support of 300 lb., and it supports 480 lb. of static weight. It has double-riveted front and rear leg cross braces and double hinges on each side for stability. The seat and backrest are upholstered for comfort, with 1-1/4" thick, 0.9 lb. density foam in the seat and 1.2 lb. density foam in the backrest, and covered with fabric abrasion tested to withstand 30,000 double rubs for durability under heavy use (abrasion testing uses an oscillatory cylinder tester to rub an abradant in two directions against the fabric). The fabric is treated with Scotchgard stain and is water repellant to protect its appearance. The seat has a rounded, "waterfall" front edge to help reduce pressure on the back of the knees. The steel frame is powder coated for corrosion resistance. Replaceable polypropylene glides help protect floor surfaces. Plastic plugs at the top of the back legs have a slot shaped to hold the frame and add stability. These plugs and the floor glides match the frame color. When folded, the chair fits very close to another of its kind for efficient storage, making it suitable for institutional temporary seating applications. The chair is Materials Analytical Services (MAS) certified as low volatile organic compound (VOC) emitting furniture according to the criteria defined by U.S. Green Building Council (USGBC) Leadership in Energy & Environmental Design (LEED) 2009 for Schools, LEED 2009 for Commercial Interiors, ANSI/BIFMA X7.1-2011, ANSI/BIFMA e3-2011e Furniture Sustainability Standard - Section 7.6.1, and the MAS Certified Green program. The upholstery meets the flammability requirements of the California Bureau of Home Furnishings and Thermal Insulation Technical Bulletin 117 (TB117).